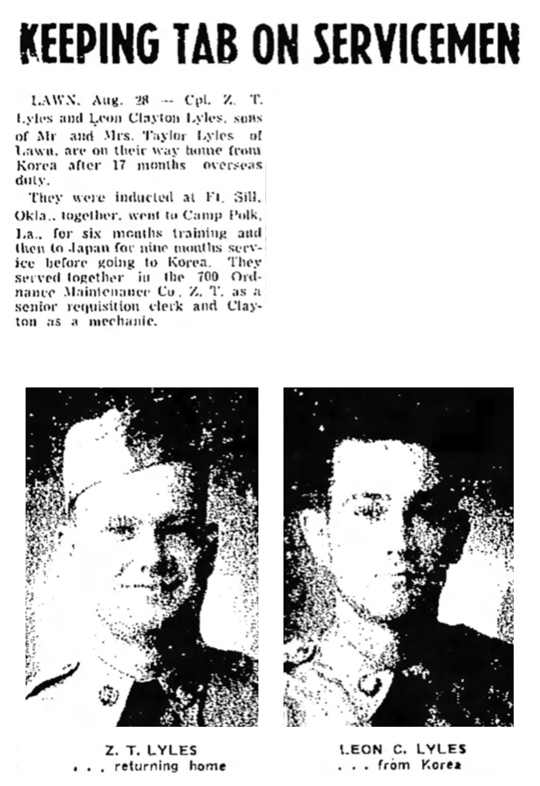 Leon Clayton Lyles, son Zachary Taylor Lyles and Beulah Magnolia Blackwood, married to Patsy Cooley and buried in Fort Bliss National Cemetery, El Paso, El Paso Co., Texas. Services for Clayton Lyles, 72, who passed away Thursday, Nov. 23, 2000 at Sunset Villa Care Center, were held Saturday, Nov. 25 at Terpening and Son Chapel in Artesia (Eddy Co., NM). The Rev. Travis Allen and Vic Clack officiated. Burial followed at Fort Bliss National Cemetery in (El Paso, El Paso Co.) Texas. Lyles was born Feb. 27, 1928 in Lawn, Texas, to Taylor and Beulah (Blackwood) Lyles. He served his country in the U.S. Army in Korea. He was married to Patsy Cooley on April 24, 1955 in Big Spring, Texas. He was a retired farmer. Lyles was a director and deacon for the Lakewood Baptist Church and a men's Sunday school teacher. He was recognized in 1983 for outstanding conservation farming practices by the Central Valley Soil and Water Conserva- tion District of New Mexico. He is survived by his wife, Patsy, of Lakewood; two sons, Owen Lyles of Lakewood and Lonnie Lyles of Artesia; one daughter, Patty Dudley of Cloudcroft (Otero Co., NM), two brothers, Z.T. Lyles of Hagerman (Chaves Co., NM) and Waynon Lyles of Lake Arthur (Chaves Co., NM); and four grand- children. Memorials can be made to Society for Progressive Supranuclear Palsy, Inc.-- Woodholme Medical Building Suite 515, 1838 Green Tree Rd., Baltimore, Md. 21208 or Gideons International.